The Club Landor Resort is a relatively small, family-friendly Bahamas retreat that can be found on Paradise Island. The more exact location is at the Atlantis Marina. A short walk away is the Atlantis Resort and everything that it has to offer. 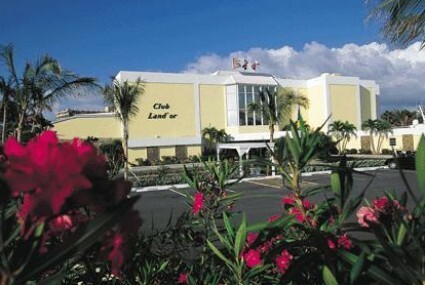 Club Landor Resort guests are also close to the bridge that connects Paradise Island to the island of Providence, and it is just a short boat or taxi ride to downtown Nassau. Beautiful beaches are also close by and include Cabbage Beach and Atlantis Beach. Beach Access Passes are required for Atlantis Beach and can be arranged through the Club Landor staff. The Club Landor Resort on Paradise Island offers guest units that are referred to as villas. Each villa room can accommodate up to four people and features a fully-equipped kitchen, separate living and dining areas, and many of the general comforts of home. Guests can even request a DVD player and fill their down time watching their favorite movies. Other certain amenities, such as irons, beach towels, and hair dryers, can also be requested at the Club Landor, and it is possible to arrange meal plans before arrival. Prospective guests might also take an interest in the resort’s activity and specialty packages. There are so many fun things to do on a Bahamas vacation, and Club Landor guests can conveniently arrange any number of activities at their resort. These activities include such things as snorkeling and scuba diving, going on a sunset cruise, or enjoying a tour that highlights Bahamian culture and history. After a full day, some nightlife can be enjoyed at the Club Landor Resort, and if nothing else, getting some dinner at the hotel’s award-winning restaurant can be a great way to cap off another great day in paradise.